For a laboratory experiment, we may need many electric components. Before we use these components, we need to read or judge their values which are very troublesome and error-prone. For example, we need to know the right resistor color bars for a specified resistance value before we can use it. Currently the Android phones are very popular. If we can use the smart phone to show the right color bars for a specified resistance value, it will be very convenient and can also reduce the judgment error. 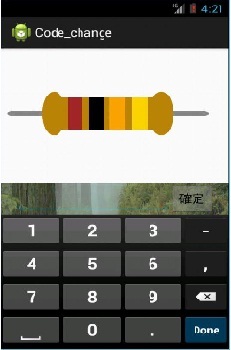 So we write such a program for the Android device which can display the corresponding resistor color bars for a speficied input resistance value. In the future, we hope the program can also make resistor recognitions, that is, you take a real resistor to the phone, and the phone will be able to automatically read out the resistance value. If one day the program can also show or read other electric components, then it is the truly components master.